Do you dream about the amazing dishes being prepared on MasterChef: The Professionals? For those of you that want to put yourself in Monica Galetti and Marcus Wareing’s shoes, you can try some of the dishes for yourself at Adam Handling’s The Frog E1, Shoreditch. Jamie Park, the restaurant’s head chef and contestant on MasterChef: The Professionals will be serving the dishes he created on the episode for one week post-airing, in celebration of his debut on one of the nation’s favourite foodie competitions. Jamie started as the restaurant’s sous chef under Adam Handling when the restaurant opened in June 2016. 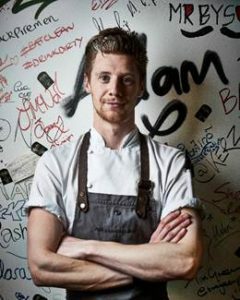 Having worked with the team for four years, Jamie was promoted to head chef when Adam opened his new restaurant, Frog by Adam Handling, in Covent Garden this September and works with Adam overseeing the Shoreditch restaurant. Keep an eye on Jamie Park’s (@jamie_park1) and The Frog E1’s (@thefroge1) social media for the dates of the dishes being served. MasterChef: The Professionals began on November 7 on BBC and you can catch Jamie in action on BBC iPlayer. For more information or to book a table visit www.thefrogrestaurant.com. News Adam Handling, Jamie Park, Marcus Wareing, MasterChef: The Professionals, Monica Galetti, Shoreditch restaurants, The Frog E1. permalink.